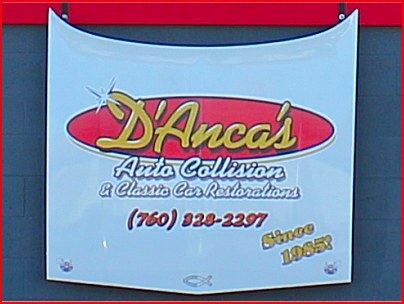 D’Anca’s Auto Collision, Auto Body and Classic Car Restorations in Palm Springs has been serving the Coachella Valley since 1985. With us, it is all about YOU and being the best at what we do. Offering our friends and neighbors the personalized care and attention to detail that we have become famous for has given us a valley wide reputation that we are proud of and work hard to retain. We are well aware that our customers have choices so when you come to us, we focus on earning and keeping your trust and confidence. We understand that your car is a very important part of your life. Getting it back quickly after an accident, restored to perfect condition is how we do business. Whether you need a paint job, a new windshield, a complete detail, body work, or the total restoration of your classic automobile D’Anca’s is up to the task. We work with your insurance company too, so that you are not bothered with frequent phone calls and bothersome details that we can handle for you. We repair and restore all years, makes and models of vehicles, both foreign and domestic, ensuring results that keep our customers coming back year after year for all their automotive needs. Here at D’Anca’s we are not finished until you say the job is done. We accept all major insurance coverages and assist you with filing your claim. If the work is elective we take the greatest care to save you every dollar possible while still doing the same great job. We also accept all major credit cards and make sure you have a detailed, itemized list of everything we did including parts and labor. Don’t trust your own special vehicle to just anyone. Three decades of superior service in an elite area such as Palm Springs means we know how to please even the most discerning customers. Making your automobile look amazing, it is what we love to do. At D’Anca’s we still conduct business the old fashioned way, with a family atmosphere and personal attention. Big City amenities and resources with small town waves and smiles, D’Anca’s is your neighborhood automotive professional.